Do you have a strategic plan and have philanthropic priorities been identified? Can you articulate your vision and plans in a donor-centered case for support that outlines key campaign components and corresponding funding levels? Can you describe how things will be different if the funds are raised? Is there consensus and commitment by your board and key institutional stakeholders for these campaign components? Is the board ready to support a campaign and does it understand its role? Have you assessed your internal readiness for the rigors of a campaign and do you have a road map based upon sound strategy for campaign success? Strategic planning ensures that your organization has a long-term vision and outlines the steps to take to achieve it. Effective strategic planning should also include a process to engage everyone on your leadership team, your board, and a broad array of constituents. This unified approach allows everyone to move forward together for the future of the institution, working toward the same vision. Board preparation and education allows your board members to actively think through the realities of a campaign and clarifies their intent to actively “own” and support it. An advancement audit provides an objective overview of current strengths and areas for improvement in the advancement program. Advancement audits should have both qualitative and quantitative components, including confidential, structured interviews with staff and volunteers as well as a quantitative analysis of previous fundraising data and benchmarking against peer institutions. An audit will identify key opportunity areas and critical issues likely to help or hinder your fundraising efforts. It also offers an action plan for strengthening your advancement program and provides a solid base for campaign success. Case statement development provides an opportunity to share and test major campaign themes in a persuasive, concise, easy-to-read document. It helps you to state your organization’s case for support in an emotionally compelling and factually convincing manner that demonstrates the campaign and the organization to be a sound philanthropic investment. A preliminary case for support will be used to test your organization’s aspirations during a feasibility study and it helps you have early conversations with key lead donors. A feasibility study tests your organizational vision, its highest aspirations, and its campaign goals with top prospective donors and identifies key motivations for philanthropic investment. It gives you not only a recommended campaign goal, but just as importantly, a campaign structure, timetable, and action plan for moving forward with a campaign. 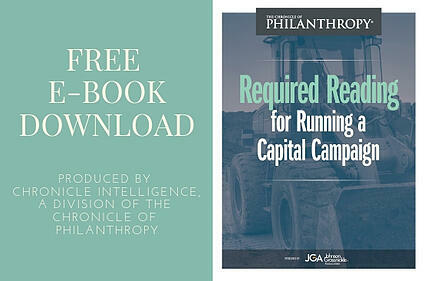 If you would like to learn more about running a campaign, download this new resource to learn how your organization can set realistic fundraising goals, develop the plans to meet them, and complete a successful campaign.